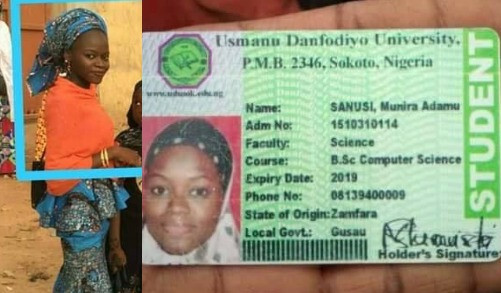 Sanusi Munira Adamu, a final year student of the Department of Computer Science at the Usman Dan Fodio University in Sokoto state, died in a fatal accident. According to reports, Munira who was heading back to school to complete her project, was killed after the vehicle she was traveling in, had a head on collision with another vehicle. She died on the spot. Her remains have since been buried according to Islamice rites. May her soul rest in peace, Amen.